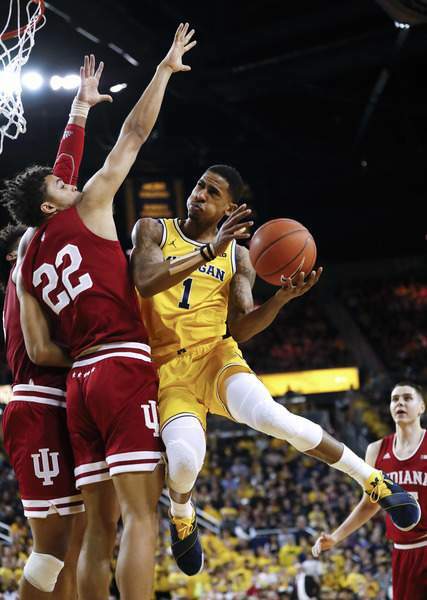 Indiana's seven-game winning streak ended with a thud Sunday against No. 2 Michigan. In the Big Ten this season, however, there will be no time to stew over a deflating loss. With as many as 10 teams harboring NCAA Tournament hopes, another challenge is always around the corner. For the No. 22 Hoosiers, that next challenge is the Maryland Terrapins, winners of four in a row and home of one of the best big men tandems in the country in 6-foot-10 centers Bruno Fernando and Jalen Smith. The Terrapins (13-3, 4-1 Big Ten) have not lost a game by more than five points all season and that one five-point defeat was against undefeated No. 4 Virginia. They're coming off a convincing 82-67 road victory over a red-hot Minnesota team and playing with a confidence that belies their youth. Maryland is mostly a collection of youngsters surrounding leading scorer Anthony Cowan, who averages 17.2 points. The rest of the rotation – Aaron Wiggins, Eric Ayala, Darryl Morsell and even Fernando and Smith – are freshmen or sophomores. The centers will likely be the focus of much of Indiana's game plan. They combine to average 27 points and 17 rebounds and pose a significant matchup problem. Not only will 6-8 Juwan Morgan have to guard a bigger, wider player, but it's unclear who will match up against the other center. One option is 6-foot-9 De'Ron Davis, who has the size to stay with either Fernando or Smith. The problem is that Davis has averaged only 11.2 minutes per game as he recovers from an Achilles injury and now has an ankle issue. It's unclear how much, if at all, he'll be able to play. “De'Ron is still struggling a little bit with his mobility,” coach Archie Miller said Thursday. “His ankle is sore. He's sort of in and out of practice, and some things he can do, some things he can't do. I'm hopeful he'll be available to play (today), but if he can't, (Clifton) Moore has got to get in there and (Evan) Fitzner has got to give us more right now. Fitzner and Moore – both 6-10 – provide needed depth in the middle, but neither has proved they are ready to guard players of the caliber of Fernando and Smith. Maryland ranks 12th in the country in blocked shots and 20th in total rebounds.